They say “never meet your heroes.” But I’ve been lucky. To a man (and a few women), the superheroes of my childhood that I’ve met have been everything I imagined them to be. One I never imagined I’d meet was Michael Gray, who played Billy Batson in the Filmation series Shazam!, finally available from Warner Archives. 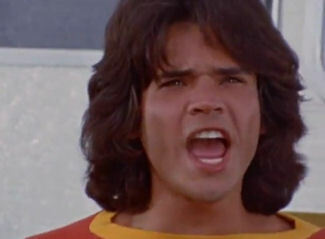 For most kids watching, Michael really was our first exposure to Captain Marvel. DC had just revived the character, but this was before comics shops took hold, and CBS had run promos all summer long before the first issue hit the 7-11s and Rexall’s Drugs. 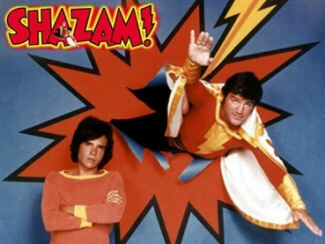 So there he was – an earnest-faced young adult with a shaggy mane but still wearing the iconic clothing of Billy Batson. Long-sleeved red-shirt with a yellow collar and blue pants, and nobody ever commented on it. Anyway, you talk about your role models – Michael Gray was one, while simultaneously a teen heart-throb in magazine pages alongside David Cassidy and Rick Springfield. So when Gary Miereanu messaged me at Comic-Con and asked if I wanted a chance to talk to Michael, I could only say one thing: Shazam! And I met an older man who understood and appreciated the legacy he was a part of, humble and kind. The mane is a lot shorter now, but the man who believes you should spend your life doing good – he’s still the same. Derek McCaw: How does it feel to finally see this on video after all these years? Michael Gray: Amazing. It’s amazing. I can’t tell you how overwhelmed I am. Shazam! is such a major part of my life. And for thirty some odd years, it just collected dust. I run into people ten times a week who ask me, “when is Shazam! going to come out on DVD?” “Have they ever put it back on TV?” “Are they doing a movie?” No, no, no, no, no. And they just showed it (at Comic-Con), it’s happening now. 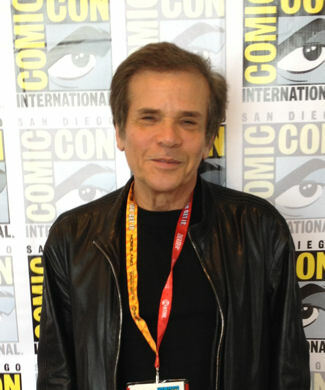 And for me to come down to Comic-Con… I’ve never been here. Derek McCaw: This is your first time at Comic-Con? As a coincidence, they were finally doing the DVD. So timing is everything. Derek McCaw: Have you had a chance to walk around? Have you felt the warmth of fandom? Michael Gray: A little bit! I had an eleven o’clock signing this morning with a writer named Andy Mangels and Lou Scheimer of Filmation was there. They asked me if I would come in as a surprise at eleven o’clock and sit down with them and sign autographs. It was my first autograph signing in many, many many years. So a little bit. But it was a nice, getting that feeling that people remember. Derek McCaw: So let’s go back to those days. When the series came along, Captain Marvel hadn’t been published for some time. Were you familiar with that property at all when you auditioned for the show? Michael Gray: No. I was a Superman fan to begin with. I grew up on Superman comics and the TV show. I had just finished my first series at Warner Brothers, and they restructured the series after its first year so I wasn’t on it again. And my agent got a call from the people at Filmation and CBS, and they said they’d like to talk to me about Shazam!, a Saturday morning kids’ show, would I want to do it? And I said, sure, I’m an actor. It’s a job. So I went out there, and I really was not familiar with the show at all, the original serial in the theaters. Basically, I got there, I had auditioned, and they said I had the part. So I had to be a quick study and check out Shazam!, find out what it was all about. Derek McCaw: And once you did, what appealed to you about the part of Billy? Michael Gray: I liked it. It was a lot of fun. I didn’t know how much I would like it until years later when I found out how much of an influence my character was, and the show was, in people’s lives. I had no clue. There were such good moral values to the show, and I meet people today, last week, this morning, who say, you have no idea what you did for me as a child. You helped me get through life. You made the better man that I am today, or the better woman that I am today. And that’s a nice feeling. I didn’t know the show had that much strength and power back then. Derek McCaw: Was there ever a time that you yourself wanted to consult the Elders? Michael Gray: (laughs) Exactly. Lou Scheimer was one of the Elders, actually. Busting through your televisions once more! Derek McCaw: It was one of the first, if not the first, live action shows that Filmation had done. How was that to be part of that new era of production? Michael Gray: I liked it. As an actor, I had a series again. As a second series, it’s wonderful. It didn’t matter if it was Saturday morning or prime time. The fact that it was one of the first few live-action shows on Saturday morning was exciting. It wasn’t a cartoon. That I was working – that was exciting. Derek McCaw: Anything that stands out from that time? You say it was years later that you came to appreciate the impact the show had on people, but was there any clue? I can remember seeing you on the cover of Teen Beat and so forth, and that must have been very different, too. Derek McCaw: So two very different fan bases. 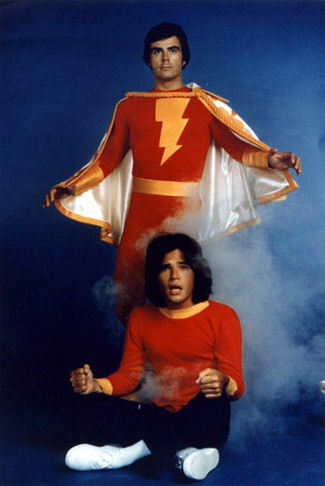 My older cousins knew who you were because of that, and I knew who you were because of Billy Batson. Was it hard juggling those two different kinds of fame? I knew that I had certain moral values I had to take with me every day on the street. Because once you’ve signed a contract with the studio, ethically, you have to be sure you don’t do anything wrong. Because you’ve got kids watching. I didn’t know what they were going to be. It’s nice now that I’m an adult, I’m a man, I’m mature enough to realize what I did for people. It makes me feel good. Derek McCaw: Do you have a favorite moment from working on the show? Michael Gray: Yes. I have a favorite show and a favorite moment. It was called “Little Boy Lost,” where this adorable little kid and his puppy were stuck out on a rock. And I had to get them off of it, not as Captain Marvel but as Billy. Through this freezing ocean water, I had to get this kid off this rock. And I really got into it, really got into character. I was helping this poor child and his little baby puppy. It was heart-warming to me. I almost broke into tears. That’s a moment that I’ll never forget. It was adorable, this little boy and his dog, and I was saving them. And I really thought I was. I was an actor, playing a part, but I thought I was. Derek McCaw: There were moments you became Billy. 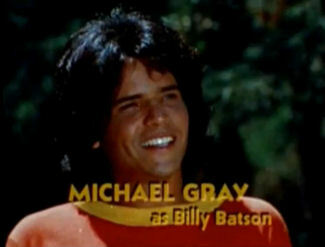 Michael Gray: I really was Billy, and I remember it well.